Let’s take a moment to remind ourselves how lucky we are to have the Masters, the last unscrewed-up major event in sports. I spent much of Sunday afternoon switching between my TV-watching glasses and my household-appliance-degunking glasses. The dishwasher had developed a bad smell, which my wife had asked me to eliminate, but the big kitchen TV is all the way on the other side of the room, so I had to keep running back and forth. Masters commercial breaks are so short that I barely had time to take a whiz, much less to figure out how to disassemble the main spray arm, and I ended up needing almost five hours to do a chore that ought to have taken ten or fifteen minutes—although I was glad to have an outlet for my nervous energy. What a tournament! And the next one is just fifty-one weeks away. Now for some idle speculation. If Tiger Woods, despite his extraordinary troubles on Saturday and his putting problems on Sunday, had played the tournament’s final three holes in four under par, he would have been in the playoff with Angel Cabrera and Adam Scott. Plausible? Well, I can’t speak for Woods, but it’s happened before. The weekend before the 1998 Masters, Warren Stephens (whose father, Jack, was Augusta National’s chairman at the time) and Hootie Johnson (who succeeded Jack a month later) played a tense five-dollar nassau against Lance Barrow (the producer of CBS’s tournament broadcast) and me. I was on the grounds doing research for my book The Making of the Masters, and the most important element of that research (in my opinion) was becoming intimate with the golf course. The match went back and forth, and things looked dark for Barrow and me. But then I birdied the sixteenth (eight-iron, six-foot putt). And then I birdied the seventeenth (driver, lob wedge, fifteen-foot putt). And then I eagled the eighteenth (three-wood, pitching wedge). 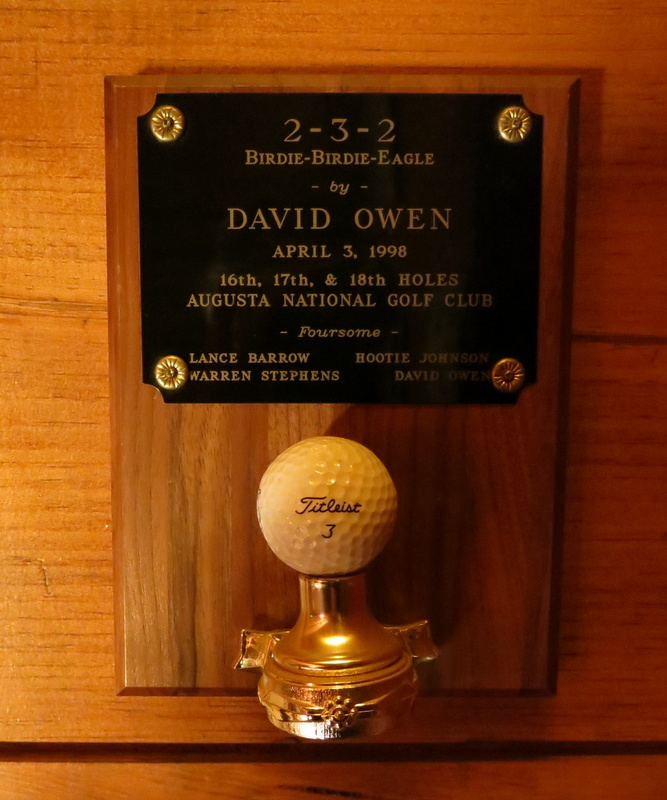 That’s four under par on the last three holes—2-3-2—and I have the scorecard (above) and the plaque (below) to prove it. 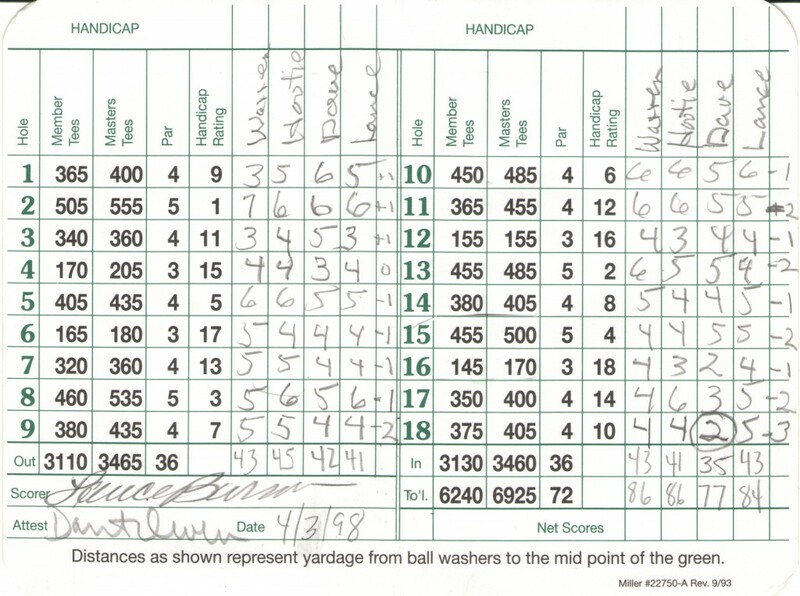 If Tiger had managed the same on Sunday—well, who knows? I didn’t see my final shot go in the hole, but Ernie Els and Lee Janzen, who had been playing a practice round just in front of us, did. Then they joined us for a beer. Then home for a one-hour nap. Then sublimity. I am unreasonably happy that Adam Scott won it for some reason. What kind of grill is that? Usually a very dirty one. It’s a Weber propane. I like charcoal better (of course) but everyone is too lazy for that. At our first sleepover, though, we grilled steaks on a temporary charcoal fire pit that we made in the gravel in the middle of the Executive Parking Lot, behind the clubhouse. 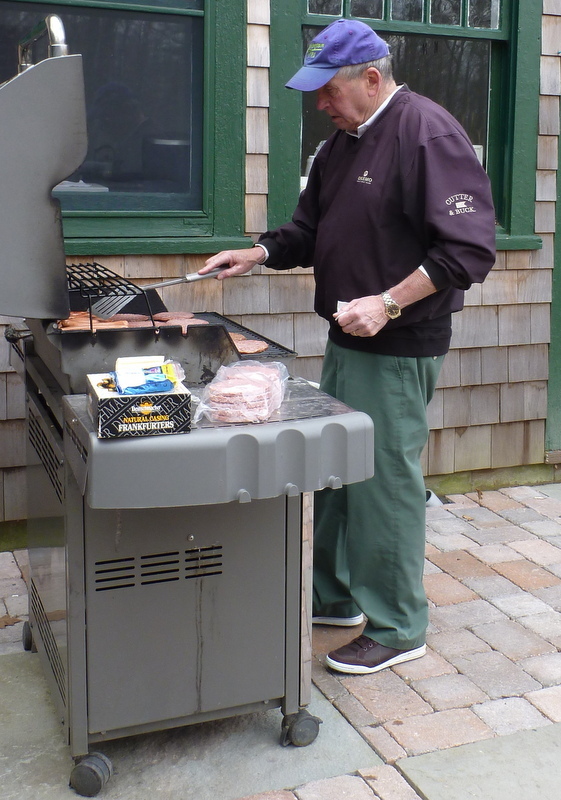 I am shopping for a grill and was leaning toward the American Outdoor Grill but decided anyone that goes 2-3-2 at Augusta needs to be consulted; sainthood is in order. Of all the grills I’ve owned, the ones I’ve liked the best have been plain old bottom-of-the-line Weber charcoal kettle grills. My father swore by a fancy charcoal grill from a company called Hasty-Bake, but I had issues with mine, which I ended up with because my sister, who had received it as a wedding present from one of her husband’s relatives, didn’t want it. I’ve never owned a propane grill–partly because, in my opinion, they don’t get hot enough, and they’re hard to use for smokin’. I also have a barrel-like two-chambered Char-Broil charcoal smoker, but I have issues with it, too. I like your Major’s format. 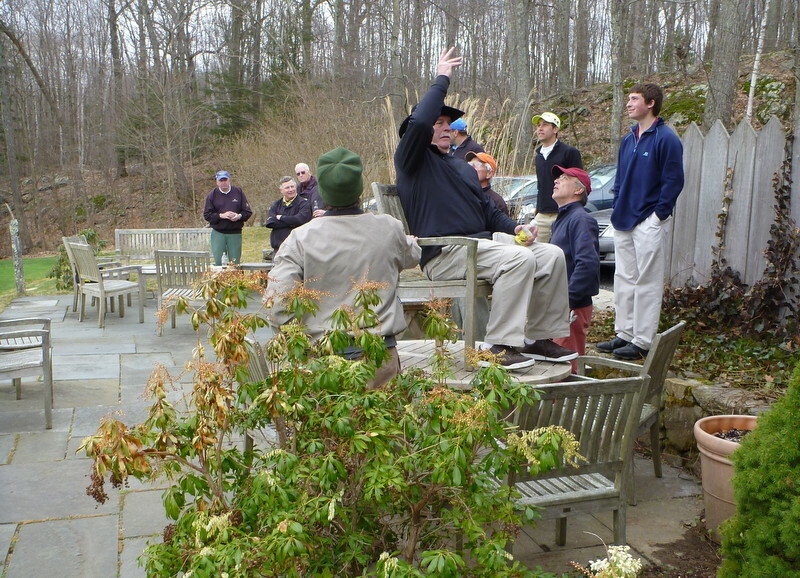 Our men’s group has done a Virtual Pro-Schmo event the last two years to correspond to the Masters. We take the 10 best scores on Friday at the Masters and post their scores to par on each hole to our scorecard. Then each of our guys picks a card out of a hat to determine their virtual best ball partner on Saturday. Our guys get their handicap and it is the net best ball of them and their virtual pro. Last two years it has taken about 12 under to win the event. Like your format it gives our guys a sense of involvement in the Major and it is really fun to have Rory or Sneds covering your back for the afternoon. Great fun. This is great. Maybe we’ll try it for the Open. I’ll discuss that tomorrow with Hacker as we drive to Dyker Beach, where he and I are going to be doing some Golf Digest research. Hacker says that teaching Virtual Pro-Schmo to our friends would require “twelve hours of classroom time,” but I’ve thought of a slightly simplified version, which I think even they could handle. Details later. Tell Hacker (his real name) that it is very simple if one of you (someone who scored over 430 on their Math SAT) fills out the pro scores on the cards ahead of time. Then their only overhead is pulling a card from the hat and filling in the dots for their shots on each hole. I trust you can do this in “six hours of classroom time” easily. Believe it or not, this is exactly what we both figured out, independently! We’re going to do it for the U.S. Open–although I think that rather than competing in pairs we’ll add one pro to every team of three or four schmoes, then play off scratch. It’s a great concept. A great David Owen story, I enjoyed it very much. Wow!!!! what a finish..How do you not talk about that everyday since then?? I think the All England Lawn Tennis Club might disagree with you. Where did you get the plaque made? The club sent it. Somewhere in Augusta, I assume.